Mr. Munendra Singh Chauhan currently working as Registrar in Roorkee institute of Technology, Roorkee since Feb, 2011 & he has also been with Ayur Living India TV since May, 2009 to Jan, 2011 as Broadcasting Engineer. 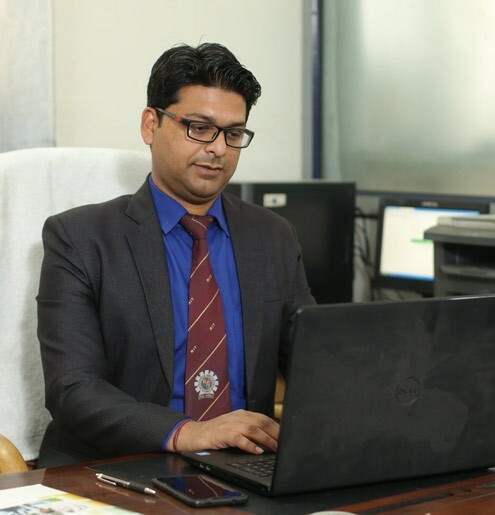 He has completed his undergraduate (B.Tech in Electronics & Communication Engineering) from UPTU, Lucknow & Postgraduate (M.Tech in Digital Communication Engineering) from UTU, Dehradun. He has more than 10 years Teaching & Administrative Experience at Reputated College & Companies. I heartily welcome you to RIT, Roorkee: a splendid temple of learning. We at RIT, Roorkee are committed to open vast avenues of learning, especially in cutting edge technologies with thrust on creation & innovation. It is the Innovation that can lead our country towards development and help us in attaining a remarkable position on the world map. Today, our survival in this world of competency depends on our ability to innovate. It is said that much celebrated Information age is now over and we are now in the creative era, where speed of innovation is the only key to sustainable development. But we have also to remember that knowledge is one of the most powerful tools to succeed, so invest your time and efforts to identify appropriate competencies based on your interest, aptitude and social values associated with them. We, with our committed faculty and staff assure you our full extended support and enough freedom to explore your full potential. The realization of your potential will definitely empower you to face the challenges of the future. We all are well aware about the need of quality education and conducive environment for learning. RIT, Roorkee has taken all the essential measures to impart quality education to its students. For this purpose we have established virtual labs with IIT Roorkee.